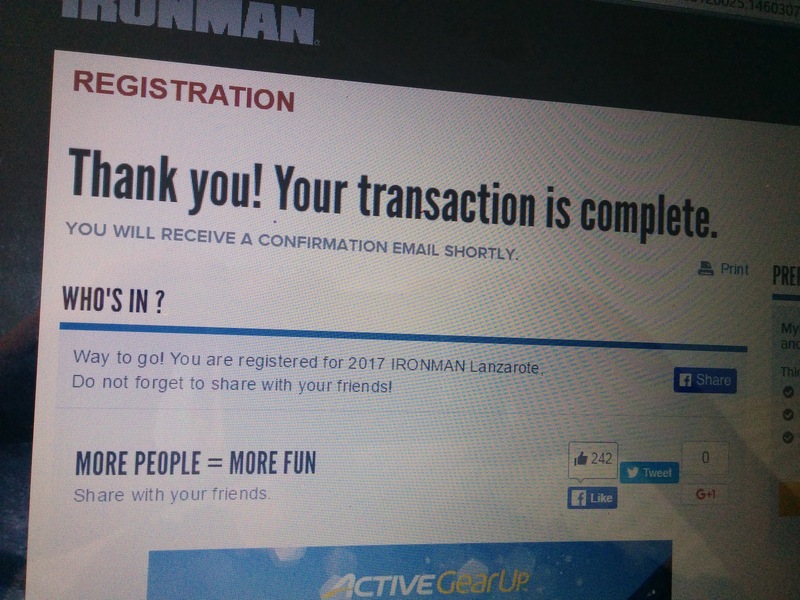 Yep, seven months away, I will attempt one of the hardest Ironman races on the planet. Crazy winds, 2551m of climbing, I can’t wait! Once again, I’m sure it’s all the fault of my awesome tri-buddy Kay! She convinced me that this was a good idea by regaling me with stories of the race, which she completed in 2014. We are excited to be planning this adventure together and training together and… there’s just one teeny tiny hitch… she will be spending the next nine months 4000km away in Montreal. She has challenged me to post weekly training updates so that we can remain connected through this journey, until we meet up again in London on the way to Lanzarote. Training isn’t going quite as well as I hoped right now. I have had some challenges with an injury that has been keeping me off running – hopefully I am getting on top of that now. In summary:Need to run more, ought to bike more, need to swim…at all. There is the small issue of a marathon in a month, I’ll tell you about that in another post, but suffice to say i’m under-trained. In good news though, biking has been going quite well, and my new training plan is looking good going forward – watch this space..
At risk of repeating myself, there’s this niggling leg injury…I’ve been trying to work around this and keep up my training, but there’s really no better training for running, than running. So that’s been my biggest challenge recently. Motivation has been a little on the low side, the weather has become rather less inviting recently. Of course, the weather is unlikely to significantly improve in the next few months, so much of my training will have to move indoors. I am trying to get as much hill practice in as possible before that happens. The absence of my training buddy poses a big challenge for me during the preparation for this race. The accountability of these updates will also be pivotal in keeping me honest – I need you dear readers! If you see me lurking on facebook, or in the local Tim Hortons, send me home to bike more. All offers of workouts will be gratefully received. Auditions for a new best training buddy will be held soon…just kidding, 4000km is not enough to keep us apart. I have four weeks before the marathon, which I hope to finish, under the five hour time cutoff. The other thing I want to achieve in the short term, is to really get my training plan working for me and my schedule. This is very important if I am to be ready for Ironman in May.I am aiming for consistency, which, I hope will naturally lead to improvement. Also, I will refrain from making goals for the actual race, It’s not really helpful, my only goal is to do my best on the day, anything else will follow. I invite you to follow me on this adventure…poke me, shove me, congratulate and encourage me, or yell at me to get moving.